Coptic icon of Saint Anthony the Great. The Desert Fathers (there were also Desert Mothers) were Christian hermits, ascetics, and monks who lived mainly in the Scetes desert of Egypt beginning around the third century AD. The Apophthegmata Patrum is a collection of the wisdom of some of the early desert monks and nuns, still in print as Sayings of the Desert Fathers. The most well known was Anthony the Great, who moved to the desert in 270–271 and became known as both the father and founder of desert monasticism. 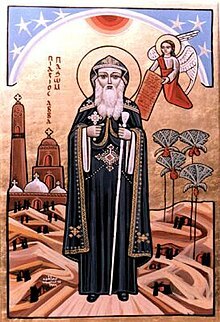 By the time Anthony died in 356, thousands of monks and nuns had been drawn to living in the desert following Anthony’s example — his biographer, Athanasius of Alexandria, wrote that “the desert had become a city.” The Desert Fathers had a major influence on the development of Christianity. The desert monastic communities that grew out of the informal gathering of hermit monks became the model for Christian monasticism. The eastern monastic tradition at Mt. Athos and the western Rule of St. Benedict both were strongly influenced by the traditions that began in the desert. All of the monastic revivals of the Middle Ages looked to the desert for inspiration and guidance. Much of Eastern Christian spirituality, including the Hesychast movement, had its roots in the practices of the Desert Fathers. Even religious renewals such as the German evangelicals and Pietists in Pennsylvania, the Devotio Moderna movement, and the Methodist Revival in England are seen by modern scholars as being influenced by the Desert Fathers. 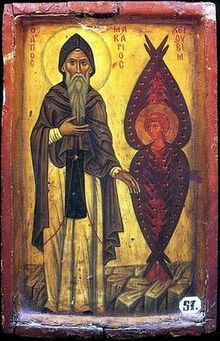 “Saint Macarius and a Cherub” from The Holy Monastery of Saint Catherine, Sinai, Egypt. Paul of Thebes is often credited with being the first hermit monk to go to the desert, but it was Anthony the Great who launched the movement that became the Desert Fathers. Sometime around 270 AD, Anthony heard a Sunday sermon stating that perfection could be achieved by selling all of one’s possessions, giving the proceeds to the poor, and following Christ.(Matt. 19.21) He followed the advice and made the further step of moving deep into the desert to seek complete solitude. Anthony lived in a time of transition for Christianity — the Diocletianic Persecution in 303 AD was the last great formal persecution of Christians in the Roman Empire. Only ten years later, Christianity was made legal in Egypt by Diocletian‘s successor Constantine I. Those who left for the desert formed an alternate Christian society, at a time when it was no longer a risk to be a Christian. The solitude, austerity, and sacrifice of the desert was seen by Anthony as an alternative to martyrdom, which was formerly seen by many Christians as the highest form of sacrifice. Around this time, desert monasticism appeared nearly simultaneously in several areas, including Egypt and Syria. Over time, the model of Anthony and other hermits attracted many followers, who lived alone in the desert or in small groups. They chose a life of extreme asceticism, renouncing all the pleasures of the senses, rich food, baths, rest, and anything that made them comfortable. Thousands joined them in the desert, mostly men but also a handful of women. Religious seekers also began going to the desert seeking advice and counsel from the early Desert Fathers. By the time of Anthony’s death, there were so many men and women living in the desert that it was described as “a city” by Anthony’s biographer. Three main types of monasticism developed in Egypt around the Desert Fathers. One was the austere life of the hermit, as practiced by Anthony and his followers in lower Egypt. Another was the cenobitic life, communities of monks and nuns in upper Egypt formed by Pachomius. The third was a semi-hermitic lifestyle seen mostly in Nitria, Kellia and Scetis, west of the Nile, begun by Saint Amun. The latter were small groups (two to six) of monks and nuns with a common spiritual elder — these separate groups would join together in larger gatherings to worship on Saturdays and Sundays. This third form of monasticism was responsible for most of the sayings that were compiled as the Apophthegmata Patrum (Sayings of the Desert Fathers). The small communities forming around the Desert Fathers were the beginning of Christian monasticism. Initially Anthony and others lived as hermits, sometimes forming groups of two or three. Small informal communities began developing, until the monk Pachomius, seeing the need for a more formal structure, established a monastery with rules and organization. His regulations included discipline, obedience, manual labor, silence, fasting, and long periods of prayer — some historians view the rules as being inspired by Pachomius’ experiences as a Roman soldier. The first fully organized monastery under Pachomius included men and women living in separate quarters, up to three in a room. They supported themselves by weaving cloth and baskets, along with other tasks. Each new monk or nun had a three year probationary period, concluding with admittance in full standing to the monastery. All property was held communally, meals were eaten together and in silence, twice a week they fasted, and they wore simple peasant clothing with a hood. Several times a day they came together for prayer and readings, and each person was expected to spend time alone meditating on the scriptures. Programs were created for educating those who came to the monastery unable to read. Pachomius also formalized the establishment of an abba (father) or amma (mother) in charge of the spiritual welfare of their monks and nuns, with the implication that those joining the monastery were also joining a new family. Members also formed smaller groups, with different tasks in the community and the responsibility of looking after each other’s welfare. The new approach grew to the point that there were tens of thousands of monks and nuns in these organized communities within decades of Pachomius’ death. One of the early pilgrims to the desert was Basil of Caesarea, who took the Rule of Pachomius into the eastern church. Basil expanded the idea of community by integrating the monks and nuns into the wider public community, with the monks and nuns under the authority of a bishop and serving the poor and needy. As more pilgrims began visiting the monks in the desert, the early literature coming from the monastic communities began spreading. Latin versions of the original Greek stories and sayings of the Desert Fathers, along with the earliest monastic rules coming out of the desert, guided the early monastic development in the Byzantine world and eventually in the western Christian world. The Rule of Saint Benedict was strongly influenced by the Desert Fathers, with Saint Benedict urging his monks to read the writings of John Cassian on the Desert Fathers. The Sayings of the Desert Fathers was also widely read in the early Benedictine monasteries. 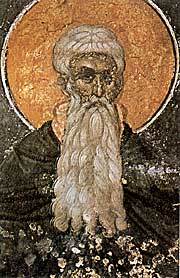 Icon of Arsenius the Great, notable Desert Father. Many of the monks and nuns developed a reputation for holiness and wisdom, with the small communities following a particularly holy or wise elder, who was their spiritual father (abba) or mother (amma). 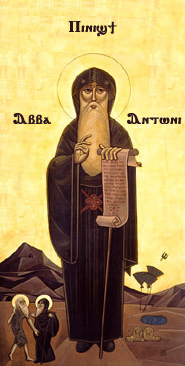 The individual Desert Fathers and Desert Mothers are mostly known through The Sayings of the Desert Fathers, which included 1,202 sayings attributed to twenty-seven abbas and three ammas. The greatest number of sayings are attributed to Abba “Poemen,” Greek for “shepherd.” Because of the wide disparity of dates for the sayings attributed to Abba Poemen, some scholars believe that “Poemen” was a generic name for a combination of different unnamed Abbas. Others conclude that the sayings attributed to Abba Poemen are accurate, based on a notable and historical Abba Poemen. Among the notable Desert Fathers and Mothers with sayings in the book, in addition to Anthony, were Abba Arsenius, Abba Poemen, Abba Macarius of Egypt, Abba Moses the Black, and Amma Syncletica of Alexandria. Other notable Desert Fathers include Pachomius and Shenouda the Archimandrite, and many individuals who spent part of their lives in the Egyptian desert, including Athanasius of Alexandria, John Chrysostom, Evagrius Ponticus, Hilarion and John Cassian. Cassian’s works brought the wisdom of the Desert Fathers into a wider arena. The legalization of Christianity by the Roman Empire in 313 actually gave Anthony a greater resolve to go out into the desert. Anthony, who was nostalgic for the tradition of martyrdom, saw withdrawal and asceticism as an alternative. When members of the Church began finding ways to work with the Roman state, the Desert Fathers saw that as a compromise between “the things of God and the things of Caesar.” The monastic communities were essentially an alternate Christian society. The hermits doubted that religion and politics could ever produce a truly Christian society. For them, the only Christian society was spiritual and not mundane. Hesychasm (from the Greek for “stillness, rest, quiet, silence”) is a mystical tradition and movement that originated with the Desert Fathers and was central to their practice of prayer. Hesychasm for the Desert Fathers was primarily the practice of “interior silence and continual prayer.” It didn’t become a formal movement of specific practices until the fourteenth century Byzantine meditative prayer techniques, when it was more closely identified with the Prayer of the Heart, or “Jesus Prayer.” That prayer’s origin is also traced back to the Desert Fathers—the Prayer of the Heart was found inscribed in the ruins of a cell from that period in the Egyptian desert. The earliest written reference to the practice of the Prayer of the Heart may be in a text from the Philokalia by Abba Philimon, a Desert Father. Hesychast prayer was a meditative practice that was traditionally done in silence and with eyes closed—”empty of mental pictures” and visual concepts, but with the intense consciousness of God’s presence. The words hesychast and hesychia were frequently used in 4th and 5th century writings of Desert Fathers such as Macarius of Egypt, Evagrius Ponticus, and Gregory of Nyssa. The title hesychast was used in early times synonymously with “hermit,” as compared to a cenobite who lived in community. Hesychasm can refer to inner or outer stillness, though in The Sayings of the Desert Fathers it referred to inner tranquility. The Desert Fathers gave a great deal of emphasis to living and practicing the teachings of Christ, much more than mere theoretical knowledge. Their efforts to live the commandments were not seen as being easy—many of the stories from that time recount the struggle to overcome negative emotions such as anger and judgment of others. Helping a brother monk who was ill or struggling was seen as taking priority over any other consideration. Hermits were frequently seen to break a long fast when hosting visitors, as hospitality and kindness were more important than keeping the ascetic practices that were so dominant in the Desert Fathers’ lives. The lives of the Desert Fathers that were organized into communities included frequent recitation of the scriptures—during the week they chanted psalms while performing manual labor and during the weekends they held liturgies and group services. The monk’s experience in the cell occurred in a variety of ways, including meditation on scripture. Group practices were more prominent in the organized communities formed by Pachomius. The purpose of these practices were explained by John Cassian, a Desert Father, who described the goal of psalmody (the outward recitation of scripture) and asceticism as the ascent to deep mystical prayer and mystical contemplation. Please Pardon me. If there is an issue with Copyright Material. I will be happy to remove the said, Material upon request.